Bicep workouts without using weights allow you to exercise at places with limited equipments. Don't know where to start? Follow our workout guidelines here! Increasing bicep mass will help you improve your overall arm strength. Lifting weights is commonly recommended for those attempting to work their biceps, but there are also many exercises that you can perform at home with limited equipments. This makes it easier to work out on a regular basis without having to invest a lot of money to a gym membership or weight set. 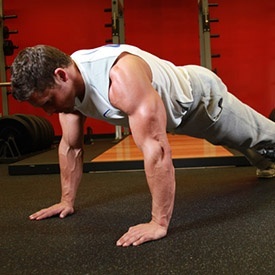 Pushups are an ideal exercise to help you build muscle in the chest, triceps and shoulders as well as the biceps. Place your hands about shoulder width on the floor with your palms turned slightly inward. Stretch your body out so your hands are touching the floor and the rest of your body makes a smooth plank. Lower yourself to the floor by bending your arms, then push your arms straight to raise yourself back up and repeat. Experiment with moving your hands closer or farther apart to make the exercise more difficult as you progress. Once you are ready to increase the difficulty of your pushup routine, begin to elevate the feet. You can start by placing your feet on a chair and work your way up to a full handstand as your strength increases. Performing a handstand against a wall will help you keep your balance. Once you are in the handstand position, lower yourself down by bending your arms the same way you would for a standard pushup. Then straighten them to push yourself back up. Like traditional pushups you can experiment with different hand placements to make the exercise more difficult as necessary. Grab a bar using an underhand grip and then hang down. Hang at a point that gives you a proper stretch in your lats, and then pull yourself up until your chest hits the bar. Lower yourself slowly and repeat. To switch it up, you can perform this exercise with an overhand grip, having your hands face opposite directions or turn the hands so they are facing each other (parallel grip). Bicep curls can be performed with or without weights based on your preference. Any heavy object that helps to provide resistance can be used as a weight for this purpose. 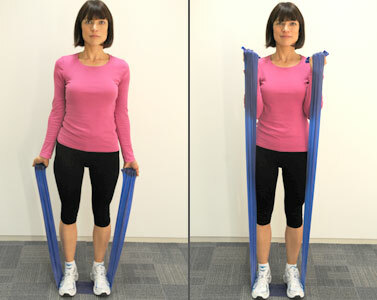 Resistance bands can also provide the necessary tension to increase the difficulty of this exercise. Hold your arms down at your sides, then curl them up toward you, bending your arm at the elbows. Lower the arm back to the starting position and repeat as necessary. Time your breathing, inhaling when you lift and exhaling as you lower your arm for better results. To perform inverted rows, lie on the ground on your back with something you can grab onto above you. A bar or a table is typically recommended for this purpose. Grab onto your object and pull yourself upwards, hold yourself in place for a few seconds, and then lower yourself back to the ground. Stand up straight with your feet shoulder width apart and the toes facing forward. Lift the arms so they are parallel with the shoulders and the palms facing down. Rotate the arm so the palm is facing up, then rotate them back so the arm is facing down. This exercise is intended to be performed with a high number of reps for the best results. If you are not using weights to perform your exercises, you may not build bicep muscle as quickly. Creating a regular routine and making a point of continuing your overall strength training will help you build muscle over time that will give you the strength results you desire. There are a few tricks you should employ to add resistance to your exercises if you do not use weights. Lower the wait time between sets so your body does not have time to cool down while you exercise. This will provide natural resistance as your muscles begin to tighten. When you perform exercises, hold your position for a few seconds before releasing to force the muscles to work harder. Increase your hold time as your muscles become more toned and it is easier for you to complete your routine. Some trainers also recommend that you flex and hold your pose for several seconds throughout the day to take advantage of Iso-tension that will allow you to build muscle.